One of the most popular stones used for the interior of the house is the Travertine. It is characterized by a beautiful and exquisite aura which never fails to give elegance to a home whenever and wherever it may be made of. Now you may ask about some tips on travertine cleaning. Caring for your Travertine isn’t really troublesome. It doesn’t require much maintenance; however, improper care might very well lead to the possible damage of your prized stone. When your stone gets damaged it can be quite costly to perform stone restoration to get back to its original form. What you could do to prevent this from happening is to seal the travertine after installation so that it could strengthen its surface and enable routine maintenance to be easier. Always keep your travertine free from dust or dirt particles so as not to damage its stone surface. If you have a travertine floor, be sure to sweep your floor regularly and mop it with warm water and a quality stone cleaner. There are available cleansers which can be used to for travertine cleaning, Travertine is an calcite based stone and any acidic product will cause surface damage to it through etching, in addition Abrasive cleaners, scouring pads and vinegar are also causes of etching. It is best if you buy one which is specialized for the travertine stone. If you spill something on your travertine floor by accident, wipe this up quickly. Spills of orange juice or other citrus-based products should be avoided to keep the stone from etching or staining. If you have honed travertine these spills are less noticeable as compared to polished or semi-polished ones. Also, in travertine cleaning, you should use coasters on all travertine and apply felt bottoms to canisters and decorative pieces before placing them on the stone. If you will be using stone cleansers on surfaces in kitchens and bathrooms, be sure to use the ones which are stone-safe. Those general purpose cleaners for sinks, tile, glass and tubs will only end up damaging your travertine. At last you have your travertine tiles, those which you have always dreamed of! Now you can’t wait to see the final product of your long awaited travertine interior. So, how can you do travertine sealing? Well, you need not ask anymore since here is a step by step guide to travertine sealing. The first step would be to secure your materials. You are a soldier of travertine sealers today and every soldier needs his weapons, and yours include a Travertine sealer, Travertine cleanser, a spray bottle and white cloths. After which, you are ready to seal! The first step in travertine sealing is selecting a sealer which is specifically designed for travertine, or on any kinds of other stones. Be careful because some sealers might damage your travertine. Second step, use the cleanser to clean your travertine tile, again, it is recommended to use the one made specifically for travertine to avoid damage and have best results. The third step is to use the spray bottle. Wet the entire surface of the travertine tile which you are going to seal. For a few minutes wait for the water to dry before doing any sealing. Step four, re wet your travertine tile with the sealer. Cover the entire surface of the travertine with the sealer. Step five, wait about fifteen minutes to wipe off the excess sealer, use a clean cloth in doing this to prevent unnecessary scratches on the stone surface. For the best results for the strongest seal, let the newly sealed travertine to cure for 48 hours. If you’re wondering if you can already walk on your travertine floors, well, yes of course you can, after approximately one hour after your seal. Then again, the longer you allow the time to walk on your travertine floor, the stronger the seal gets. It all goes down to a bit of patience to get the great results after. 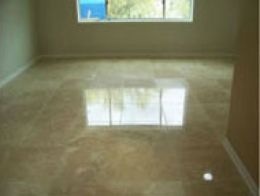 Travertine polishing: Make your travertine tiles look new! Keeping your travertine clean is one thing, but keeping it looking as if it was new is another thing. If you clean your travertine on a regular basis, think about it again, your travertine tiles could get dull and might even lose their original brilliance. This is one thing which you could never return to the travertine stone again! So instead of cleaning it often, why not consider travertine polishing. While polishing makes your travertine new, how often should you do it? It all boils down to how much they are used. You can polish travertine floors every six to 12 months, if they are in the “walking-traffic “area. When it comes to travertine countertops, it could only be necessary to polish every three years. If you were brave enough to attempt this travertine polishing as a Do It Yourself project here are some tips: A clean cloth, 400-grit sandpaper, 600-grit sandpaper, 800-grit sandpaper and a buffing pad. First you will have to wipe the travertine tiles you desire to polish. Wipe them clean as not to let unnecessary dirt and dust interfere with the polishing, next, you can sand the tile using the 400-grit sandpaper. In sanding the tiles, you have to do it in a circular motion. Use just the right pressure to remove only the imperfections on the tile top. When you have finished sanding the tiles use the cloth again to wipe the tile surface. The next step would involve using the 600-grit sandpaper, yes; you will have to sand the tile again to make the travertine be a little shinier. If you can, remove the remaining scuffs from the previous grit. Finish up sanding with the 800-grit sandpaper, to make the surface smooth. Lastly, use the buffing pad to buff the travertine to let out its glossy shine. You can now be finished with your travertine polishing. You can also use 1200-grit sandpaper after the 800 grit for travertine tiles on countertops and walls. Travertine tile are highly susceptible to staining, and hence, sealant should be applied to prevent any unwanted mark on the tiles. It should be applied at least once in a year. Many types of so-called “sealers” are on the market. Care must be exercised in selecting one. Moreover, a sealed tile surface facilitates cleaning. Polishing travertine tiles is typically a task you should leave to a professional stone company. Do NOT apply any product that is a topical coating to your travertine tile. Clean any kind of liquid spills from the travertine tiles as soon as possible to prevent any kind of damage to the floor surface. If you allow liquid spills to stand on the tiles it will get absorbed on the tile and possibly cause damage. Do not use any kind of bathroom cleaners, gout cleaners on travertine floor tiles as they may have acidic ingredients. Abrasive cleaners or cleaning pads should also be strictly avoided on the tile. The only disadvantage of travertine is that it can become dull when it comes in contact with any acidic substances like coffee, wine or juices. So for better protection of the tiles, consider using area rugs or non slip mats on the floor tile where practical. Travertine Cleaning, Sealing, Polishing & HoningAs a stone and tile restoration company, we are craftsmen who specialize solely in tile and marble cleaning , honing, sealing, marble polishing, stripping and caring for Marble, Travertine, Limestone, Sandstone, Onyx, Granite, Saltillo, Slate, Brick. TLC Carpet Care proudly serves Castle Rock, Parker, Franktown, Elizabeth, Kiowa, Sedalia, Larkspur, Lone Tree, Highlands Ranch, and Centennial CO.